I’m making this for a good friend of mine who introduced me to wood turning. I’m going to add a Brazillian Rosewood base ring to finish it off. Size is 15.5” x 5.5” x 1/8” thick. Thanks for looking. I like the lathe too, lol. 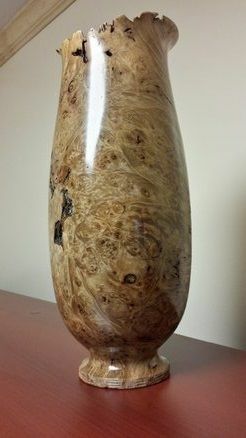 I don’t know what I’m impressed by more, the lovely burl or that it’s 1/8” thick. Fantastic looking piece. That is remarkable. What tools did you use for hollowing out that monster? How many solid days of sanding were involved :) ? Thank you very much for the kind words guys. I used my Lyle Jamieson hollowing setup and a steady rest. How the heck do I rotate my photos? BTW- the wood is from my friend that I’m making this for. Great features, best not have it fall off the table. That is remarkably beautiful.. A great gift for your friend.